I am leaving yesterday’s post online, as the purpose of a weblog is to track changes to knowledge as they occur. However I learned a great deal more about PostGIS raster today, in large part as a result of an email from Pierre Racine. As a result of my new insight I am aware that some elements in yesterday’s post may be slightly misleading. I have added a warning and will edit it further in order to avoid leading anyone astray. I hope that comparing the two posts will help others to avoid falling into the some of the same pitfalls that I did initially. The first important mistake, that I found for myself this morning after looking at the results more critically, was that I had completely misunderstood tile size. It was all explicit in the manual, but I just didn’t read it properly the first time. 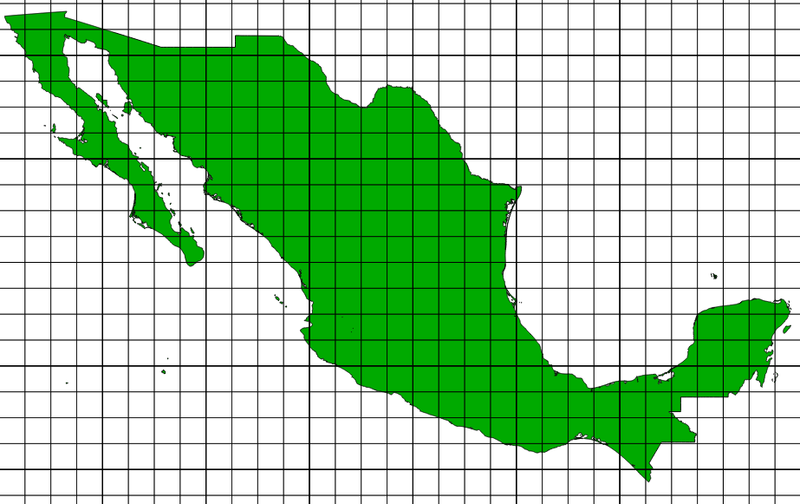 In fact, it turns out that the tile size is expressed in numbers of pixels. This is very useful to know. I should have realised this straight off by watching the insert rows commands scroll by. It never made sense to find that using a tile size of 1×1 was much faster than no tiling! 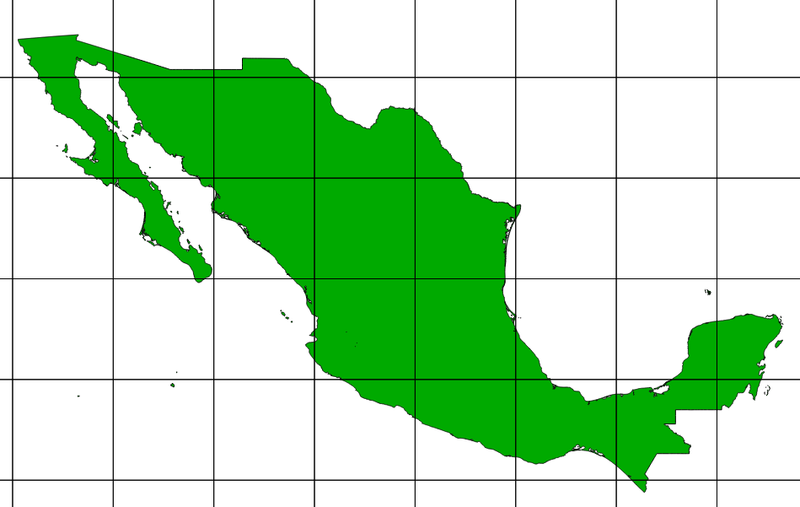 The vector representation of -t 400×400 for Mexico for the WorldCLim data at 0.01 degree resolution looks like this. One of the reasons that I did not spot the tile size issue sooner was because I had tried, and failed, to use QGIS to visualise the imported rasters. Qgis was not showing the imported layers properly, so I was working blind. I soon realised that the distorted visual representations were not due to errors when importing the data, as the results from overlays coincided with those from other programs. Nevertheless the fact that imported layers do not display well in QGIS at the moment is an understandable cause of confusion. So, the be warned. The QGIS plugin is still “experimental” until the gdal problems are fully resolved, Don’t panic if uploaded raster do not look right on the QGIS canvas as yet. Another “gotcha” involves implementing overlays to obtain zonal stats from polygon on raster overlays. I made major advances in understanding this today, thanks again to some useful advice from Pierre. It is important to add the ST_SummaryStatsAgg function before trying to build simple queries to extract zonal stats from a polygon on raster overlay. This is easy enough to do, as the function is written in SQL, so all that is involved, if it is not already included in your build, is copying and pasting the functions from here into the SQL editor and running them. The “gotcha” for me was that I intially assumed that the ST_SummaryStats worked without a grouping clause to aggregate the results, more or less in the way that the ST_SummaryStatsAgg function actually does. The raster is much faster but everything is rounded to the shapes of the pixels. My own experiments confirmed all this, and I will show the encouraging results of some experiments tomorrow. Many thanks to Pierre, for not only writing so much of the code but for being so generous with advice and patient with users. October 29, 2012 in POSTGIS, Uncategorized.